A Puppia harness is sure to set tails wagging. Puppia Basic Harness A - The harness that made Puppia famous. This lightweight air-mesh soft collar harness provides comfort at the neck and chest and comes in 11 tantalizing colors which includes camouflage. · Re-sizable chest belt for custom fit. · Secure easy snap buckle. · Fits Chest Sizes - 10 thru 29 inches. Puppia Basic Harness B - For the talented escape artist and avid puller, the Puppia harness jacket vest may be more your style. The jacket fits thru the front legs and secures in the back chest and shoulder area. The lightweight soft mesh vest comes in 7 colors which includes camouflage. · Fits Chest Sizes - 11 thru 20 inches. Whichever harness captures your fancy, you can be assured that you and your best friend will be dressed to impress by Bowwow’s Best! Here's what Dog Owners are saying about Puppia harnesses. The Puppia harness is very soft, unlike the harder nylon material harness you will find at Petco. My harnesses seemed so uncomfortable when my dogs walk the nylon would rub against them now that I have the Puppias they no longer get the painful rubbing. The leg opening is plenty big enough- no restrictions when she runs. I've tried other harnesses, but they just get tangled up. Both my boys are pullers on the leash and I feel like I have more control when they are in the Puppia harnesses. Love this harness. Light weight and the D-ring is up closer to the neck than the back so you have a bit more control than you do with a Gooby Harness. The plastic claspings make for very easy putting on and taking off. If you have avid chewers you might have to watch them if they can reach the clasping as it can get messed up. Very nice lightweight material. Straps on the back are made of a typical "nylon" type harness material. I LOVE the Puppia harnesses!!! Dex since he has collapsing trachea can't wear a collar so he has to wear his harness. I have the sky blue, denim blue striped and (yes) purple. They look so lovely on him. They wash great too. I went the next size up so it would fit lower on his neck. I LOVE them! I brought my dog the puppia harness and she loves it too. It's soft, not rough. I personally don't feel that I am pulling in a harmful way. I even got the puppia leash. It's great for training a puppy. I definitely agree to buy!!! Could not get it over his head.. to me I like them but how do you know ya got a good fit. ** See note on neck sizing below. 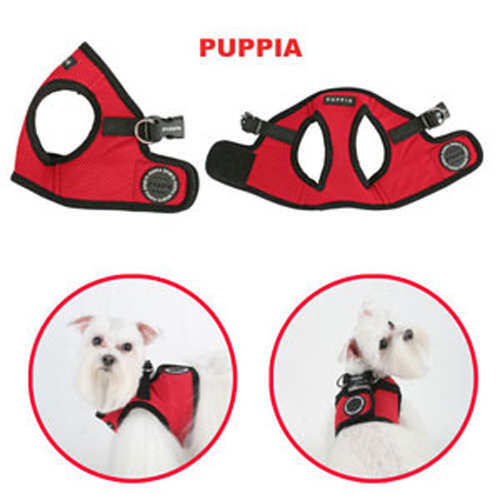 ** Note: The collar of the Puppia Harness A is not adjustable and must fit easily over the head. 1) Take the dog's chest measurement. 3) Get the Collar dimensions for that size. 4) Test to see if the product Collar dimension will easily fit over your dog's head.